Biotinylated Human LILRB1, Fc Tag (CDJ-H82F7) is expressed from human 293 cells (HEK293). It contains AA Gly 24 - His 458 (Accession # D9IDM5-1). The protein has a calculated MW of 75.6 kDa. As a result of glycosylation, the protein migrates as 100-116 kDa under reducing (R) condition, and 150 kDa under non-reducing (NR) condition (SDS-PAGE). Biotinylated Human LILRB1, Fc Tag on SDS-PAGE under reducing (R) and non-reducing (NR) conditions. The gel was stained overnight with Coomassie Blue. The purity of the protein is greater than 95%. CD85 antigen-like family member J (CD85J) is also known as Leukocyte immunoglobulin-like receptor subfamily B member 1 (LILRB1 or LIR-1), Immunoglobulin-like transcript 2 (ILT-2), Monocyte/macrophage immunoglobulin-like receptor 7 (MIR7), which belongs to leukocyte immunoglobulin-like receptor (LIR) family. 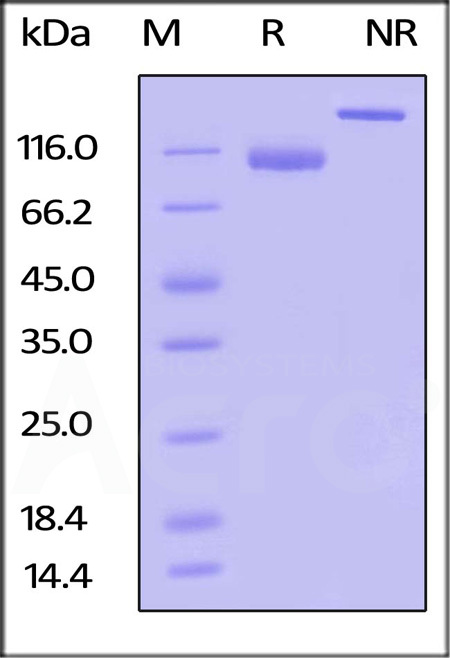 CD85J / LILRB1 Contains 4 Ig-like C2-type (immunoglobulin-like) domains. CD85J / LIR-1 is expressed predominantly on B-cells and monocytes. CD85J is receptor for class I MHC antigens and recognizes a broad spectrum of HLA-A, HLA-B, HLA-C and HLA-G alleles and is also receptor for H301/UL18, a human cytomegalovirus class I MHC homolog. Ligand binding results in inhibitory signals and down-regulation of the immune response. CD85J / LILRB1 interaction with HLA-B or HLA-E leads to inhibition of the signal triggered by FCER1A and inhibits serotonin release. CD85J / LILRB1 inhibits FCGR1A-mediated phosphorylation of cellular proteins and mobilization of intracellular calcium ions. (1) Cosman D., et al., 1997, Immunity 7:273-282. (2) Fanger N.A., et al., 1998, Eur. J. Immunol. 28:3423-3434. (3) Chapman T.L., et al., 1999, Immunity 11:603-613. (4) Bellon T., et al., 2002, J. Immunol. 168:3351-3359.